We specialise in private packages for small groups, couples and families, and below are some of our most popular itineraries. 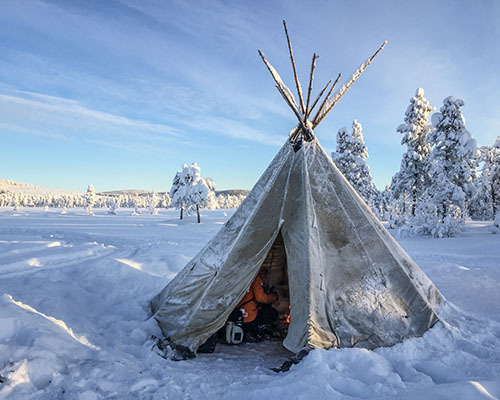 Each package has been carefully designed to showcase the best experiences that Lapland has to offer whilst enjoying our exclusive Lodge accommodation and secluded forest location. 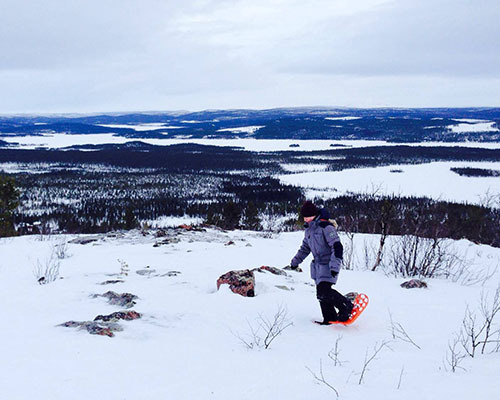 You will start with a flight to Kiruna, Sweden (at your own arrangement and cost). Once there, you will be met by your guide and taken to the kennels and your Swedish Lodge accommodation. If you are already in the area we can arrange an alternative pick up point from 13.00 hours. After a warming cup of tea or coffee and a brief introduction to your adventure ahead, you will be kitted out with Arctic outer-wear to keep you toasty during your snowy adventure. 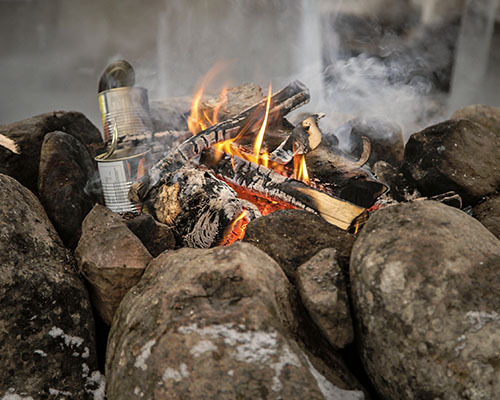 In the afternoon, you can enjoy the popular Scandinavian tradition of a hot sauna. We’ll supply everything you might need including a towel, spa goodies for washing and light refreshments. 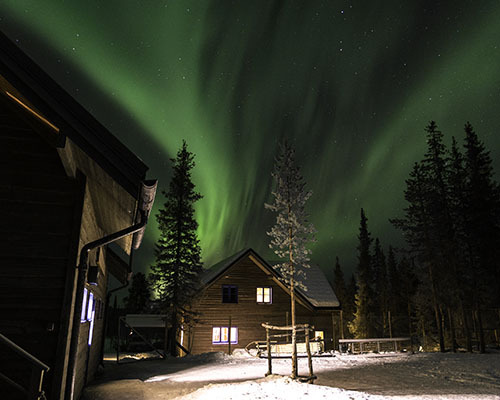 If you are brave enough you can take an invigorating break from the sauna and roll in the snow or, if you are lucky, marvel at the Northern Lights above. In the evening you can enjoy a scrumptious dinner before heading for bed. Start the day with a relaxed breakfast after which it’s time for you to meet the dogs! 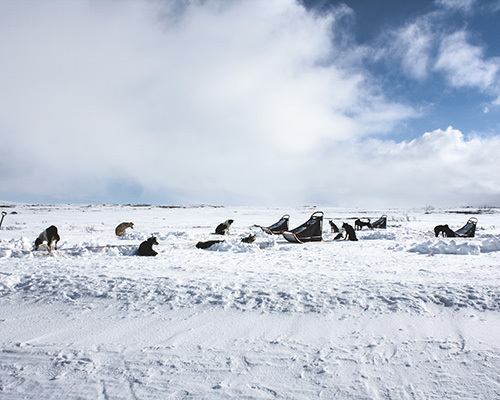 You will be given expert tuition in handling your own dog team before being given your own sled. 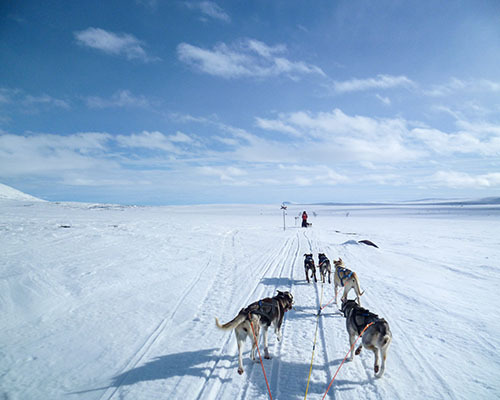 Each person drives their own sled with four dogs throughout the tour. 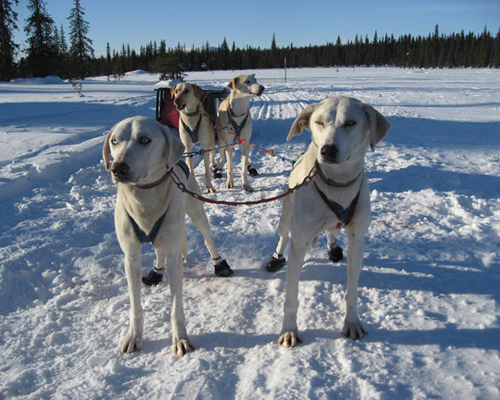 The dogs are very strong and are born to run so the start is always exciting as they finally get their wish! 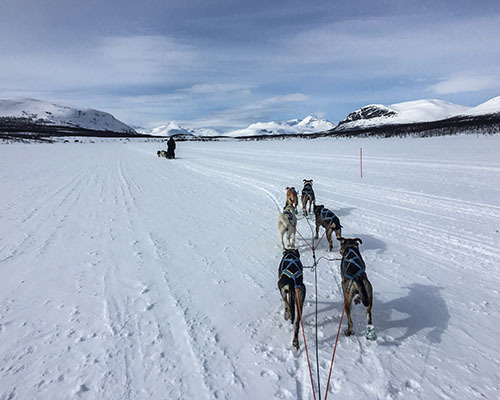 This is your chance to be a Musher and no doubt you’ll enjoy this incredible mode of transport, as the dogs yelp and bark their way across the frozen lakes and through pine forests. 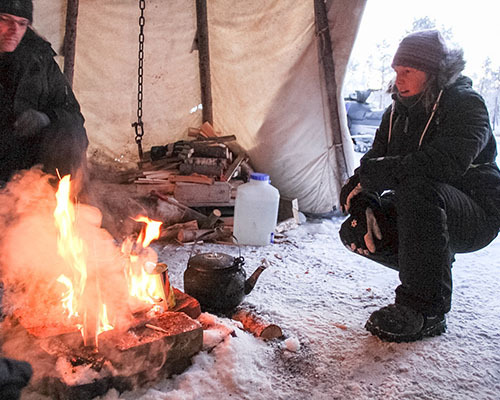 Along the trail, we’ll stop at our Lavvu, Sami-style tipi tent, for a warm lunch cooked over an open fire pit before getting back on the sled and heading down the trail once more. 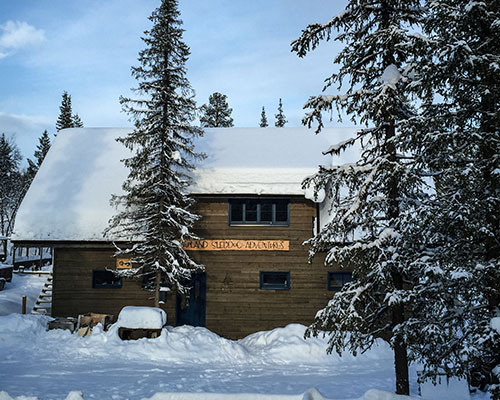 Once we’ve had our fill of dog sledding, we arrive back at the kennels where another comfortable stay at our lodge awaits. Families with children aged 4-16yrs, the children will ride on the guide’s sled and adults will get their own sleds to drive. Today may be your last day but the adventure has not come to an end yet! After breakfast you will be given instructions on how to drive a snowmobile before the surge of engine power fills your body on a thrilling ride through the frozen landscape. This is a guided tour and you will need a full drivers licence to drive a machine (Minimum 18yrs). Machines are shared between two people and we will stop half way through for you to swap drivers if you wish. Helmets are provided and must be worn. Snowshoe Walk – take a self-guided snowshoe walk up to a top of a nearby hill where you will get an incredible view of the area, seeing for miles across frozen rivers and pine forests. 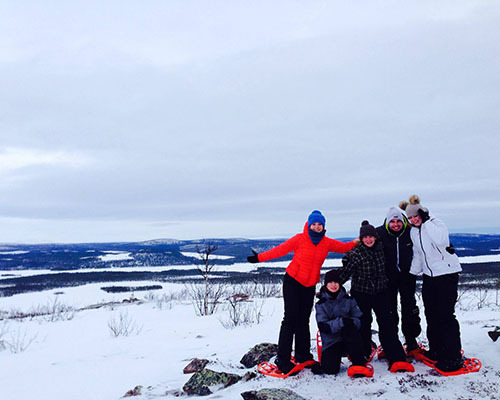 We provide you with high quality Fimbulvetr snow shoes (size 37-50) to help you along the forest trails. ICEHOTEL visit – The hotel has a world-wide reputation for being the “coolest” hotel in the world – it is in fact a constant -5 degrees centigrade no matter what the temperature outside! This temperature makes it comfortable to stay in and walk around but cool enough for the hotel’s walls, beds, chairs and bar (complete with ice glasses) to stay frozen. 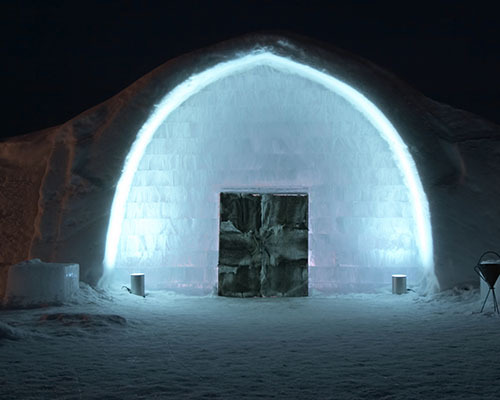 The tour ticket allows you to view the 20 or so individually hand-crafted rooms with ice sculptures as well as the ice Church. 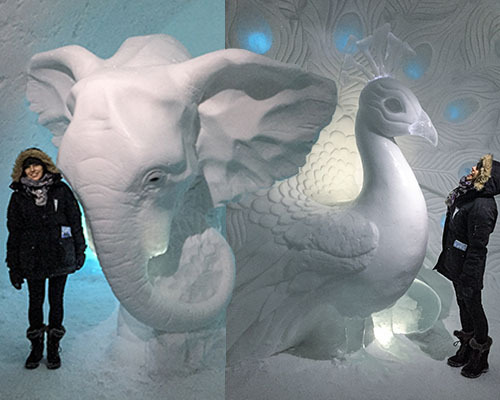 Each year the hotel melts and is rebuilt so every room is different to the last and truly unique! Our services end with a transfer back to Kiruna or the airport at around midday. For more information please read our FAQs page and for the legal detail see our Terms page. 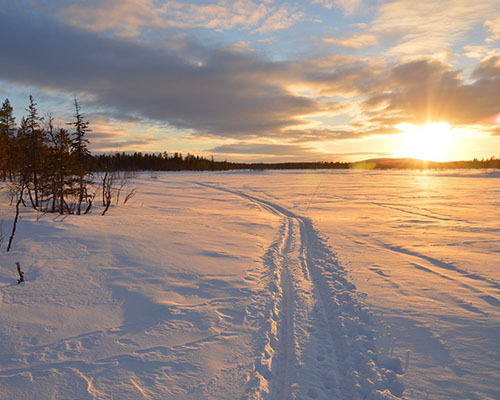 Under your own arrangement, you will arrive in Kiruna, Sweden. Once there, you will be met by your guide and driven approx. 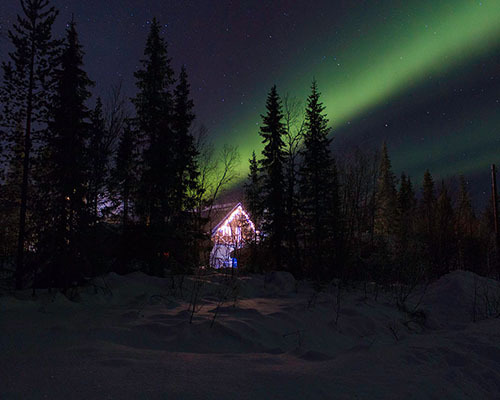 15 minutes to a Lapland hideaway in the forest. 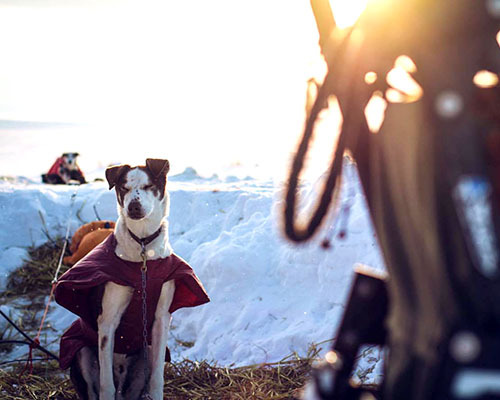 A narrow snow-covered side road leads to an opening in the forest where you will discover a small kennel of around 40 sled dogs and kennel owners Gaynor and Milos. A warm welcome awaits as you settle into your luxury accommodation at their guest lodge in the surroundings of this private complex. 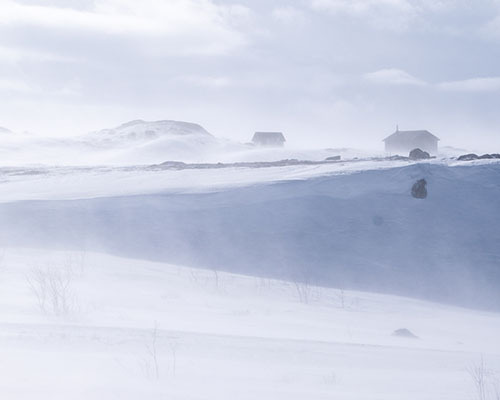 After a warming cup of tea or coffee and an introduction to what awaits over the following days, you will be supplied with high quality Arctic outer-wear to keep you toasty during your adventure. Afterwards, you can choose to relax in your room or take a wander in the immediate surroundings. Meanwhile, your hosts will warm the sauna for you to enjoy in the late afternoon before a sumptuous dinner is served in the Lodge. Today the adventure continues! After breakfast you will be given instructions on how to drive a snowmobile before the surge of engine power fills your body on a thrilling ride through the frozen landscape. This is a guided tour and you will need a full drivers licence to drive a machine (Minimum 18yrs). Machines are shared between two people and we will stop half way through for you to swap drivers if you wish. Helmets are provided and must be worn. 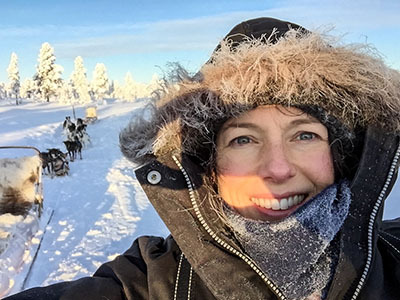 The snowmobiling route will take you along the frozen Torne river to the world famous ICEHOTEL where you will stop for a buffet-style lunch at the ICEHOTEL restaurant and have time to explore the bedrooms with their amazing ice sculptures and decorations. The hotel has a world-wide reputation for being the “coolest” hotel in the world – it is in fact a constant -5 degrees centigrade no matter what the temperature outside! This temperature makes it comfortable to stay in and walk around but cool enough for the hotel’s walls, beds, chairs and bar (complete with ice glasses) to stay frozen. 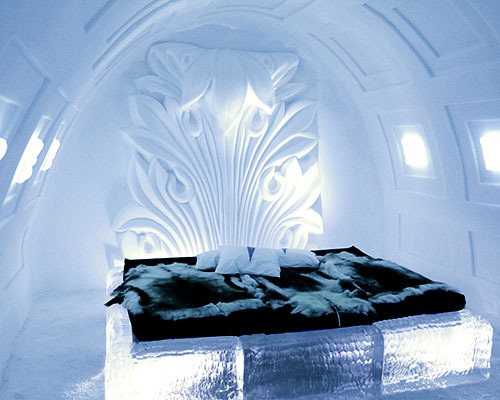 There are 20 or so individually hand-crafted rooms with ice sculptures as well as the ice Church. Each year the hotel melts and is rebuilt so every room is different to the last and truly unique! 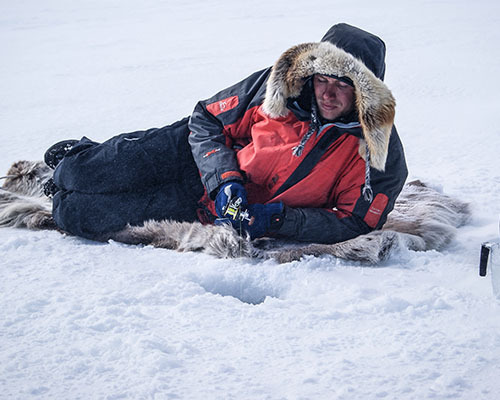 With full bellies you will jump back on the snowmobiles and enjoy the exhilaration of racing across the frozen river back to the lodge for your final night in our luxury lodge. Children can ride as a passenger with a parent driving or as an alternative the whole family can ride in a snowmobile passenger trailer together. For the comfort of children the snowmobile tour is taken in the morning. 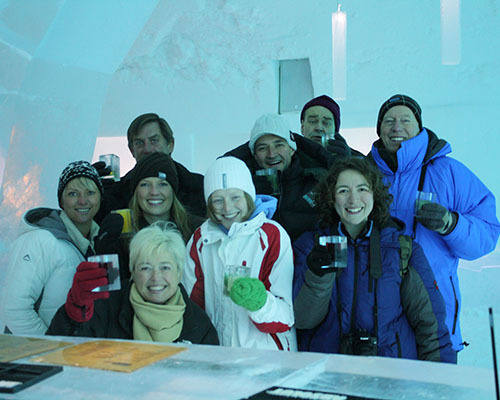 We will return to the lodge and provide a vehicle transfer to the ICEHOTEL for the buffet-style lunch and tour of the ice sculpture rooms. On your final morning, you’ll have the chance to take a self-guided snow-shoe tour into the forest surrounding the kennel/lodge and up to a viewing point on top of the hill where you’ll get a stunning view across the frozen landscape. Please note this is a bit of a climb! But worth it for the view. Your trip with us will finish around midday when you’ll be dropped off at the airport or in Kiruna to suit you. 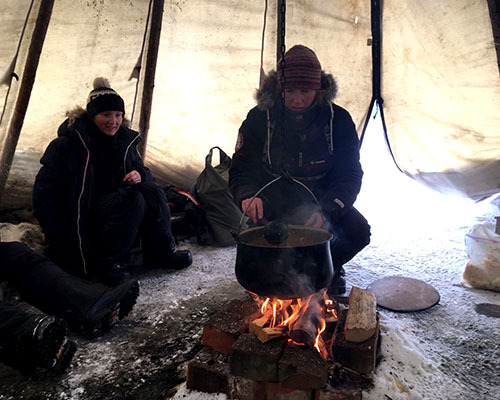 After a warming cup of tea or coffee and an introduction to what awaits over the following days, you will be supplied with high quality Arctic outer-wear to keep you toasty during your adventure. 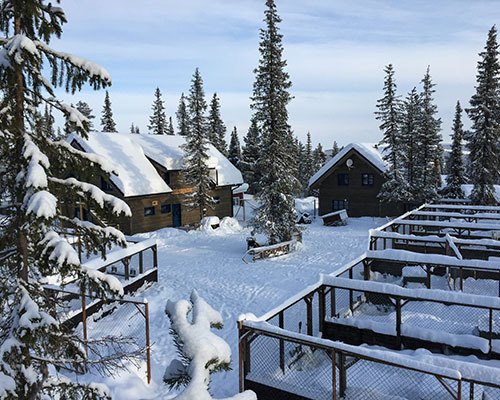 Afterwards, you can choose to relax in your room or take a self-guided snow-shoe tour into the forest surrounding the kennel/lodge and up to a viewing point on top of the hill where you’ll get a stunning view across the frozen landscape. Please note this is a bit of a climb! But worth it for the view. Meanwhile, your hosts will a sumptuous dinner that is served in the Lodge. Start the day with a self-served breakfast and then it’s time for you to meet the dogs! 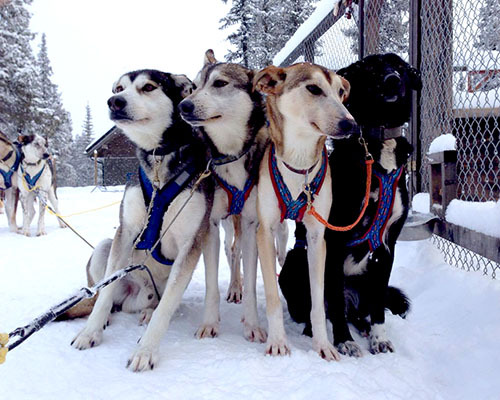 You will be given expert tuition in handling your own dog team before being given your own sled. 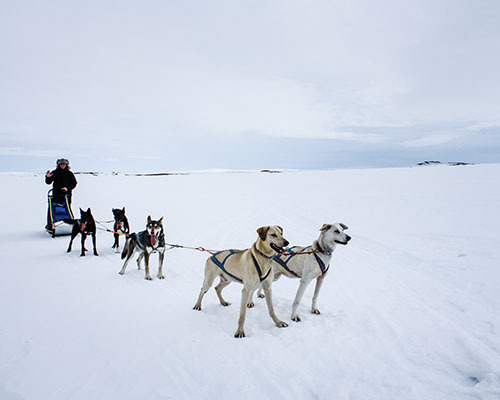 Each person drives their own sled with four dogs throughout the tour. The dogs are very strong and are born to run so the start is always exciting as they finally get their wish! 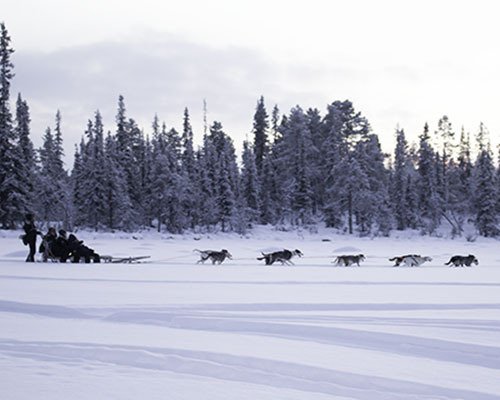 This is your chance to be a Musher and no doubt you’ll enjoy this incredible mode of transport, as the dogs yelp and bark their way across the frozen lakes and through pine forests. Along the trail, we’ll stop for lunch before getting back on the sled and heading down the trail once more. We’ll arrive at a wilderness cabin for an overnight stay and dinner will be provided. The wilderness cabins are a back to nature experience with rustic charm. The cabins are heated by wood stove, lit by candlelight and water is collected from a nearby creek. After breakfast we will continue on your dog sledding tour, returning to the kennels in the early afternoon. Lunch is provided on the trail and on your return a private sauna experience is available to sooth and relax any tired muscles before a home cooked dinner is served. After dinner you’ll enjoy your last night of luxury in our lodge. Today may be your last day but the adventure has not come to an end yet! After breakfast you will have the option to take a short snowmobile tour. With two people sharing a machine, you’ll head off on a thrilling ride through the frozen landscape with the surge of engine power filling your body. This is a guided tour and you will need a full drivers licence to drive a machine (Minimum 18yrs). We will stop half way through for you to swap drivers if you wish. Helmets are provided and must be worn. Your trip with us will finish around midday when you’ll be dropped off at the airport or in Kiruna to suit you. 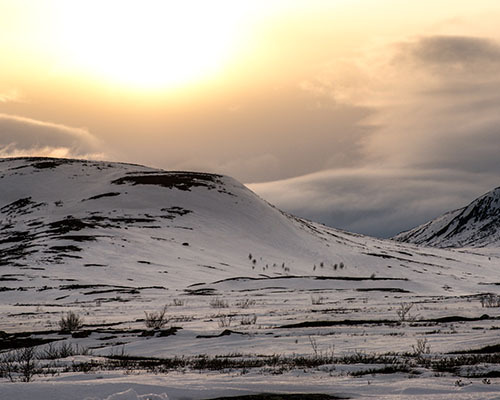 Under your own arrangement, you will arrive in Kiruna, Sweden’s Northern-most city situated approx. 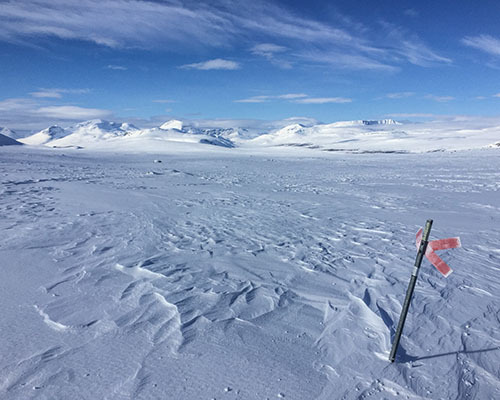 250km inside the Arctic Circle. Once there, you will be met by your guide and driven approx. 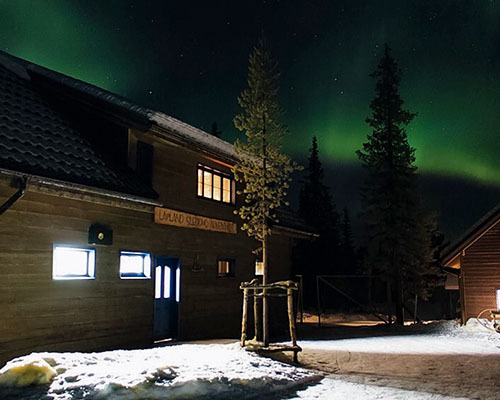 15 minutes to a Lapland hideaway in the forest. 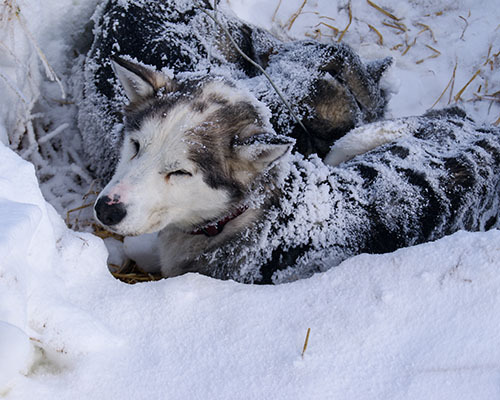 A narrow snow-covered side road leads to an opening in the forest where you will discover a small kennel of 50 sled dogs and kennel owners Gaynor and Milos. A warm welcome awaits as you settle into your luxury accommodation at their guest lodge in the surroundings of this private complex. After a warming cup of tea or coffee and an introduction to what awaits over the following days, you can choose to relax in your room or take a wander in the immediate surroundings. Meanwhile, your hosts will warm the sauna for you to enjoy in the late afternoon before a sumptuous dinner is served. After dinner, why not wander outside in the search for the Aurora? The lights can appear on any clear night throughout the winter and because our property is far away from the light pollution of the city, you have an excellent chance of seeing them! 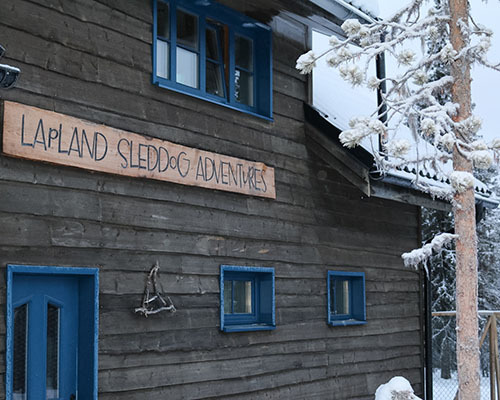 Overnight at our Swedish lodge accommodation on a twin-share or double basis. Today you will begin your introduction to dog sledding. 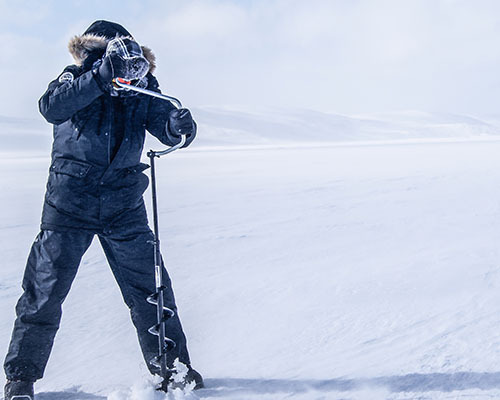 First, you will be supplied with high quality Arctic outer-wear to keep you toasty during your adventure. 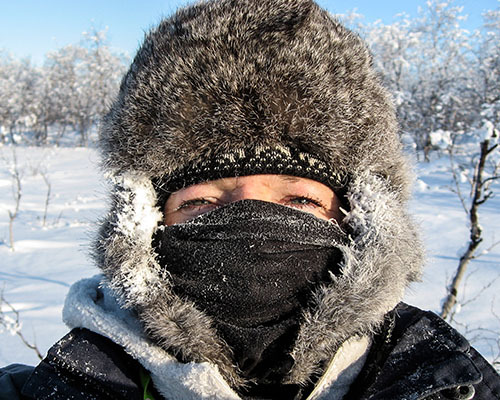 Fully kitted up, you’ll join a professional guide who will show you the basics of dog sledding. 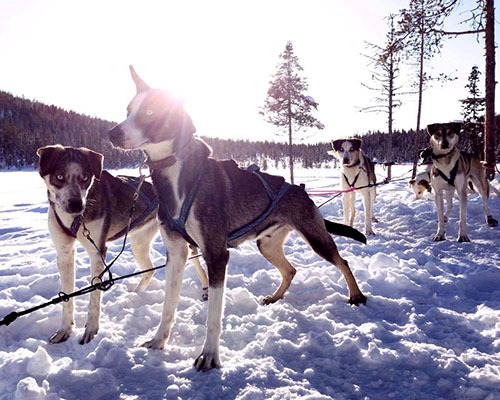 You will be shown your sled, how to control it, and how to harness your own team of dogs. This dog team will be yours for the duration of your visit which will give you plenty of time to bond with these hardy yet soft-natured animals. Following a light lunch, the excitement builds as you prepare for an acclimatization tour. Starting directly from the kennels, a private forest trail takes you beyond the trees to open spaces and across frozen lakes. The start can be noisey as the dogs bark in preparation for the off but once on the move the raucous gives way to silence and you can settle in to driving your own sled through this incredible landscape. Once back at the kennels, the dogs return to their yards and you can enjoy a warming dinner at the lodge before heading for bed ready for more adventure tomorrow. After a hearty breakfast, today you will continue your dog sledding adventure. Already feeling more confident on the sled, your guide will whisk you off into the forest once more. 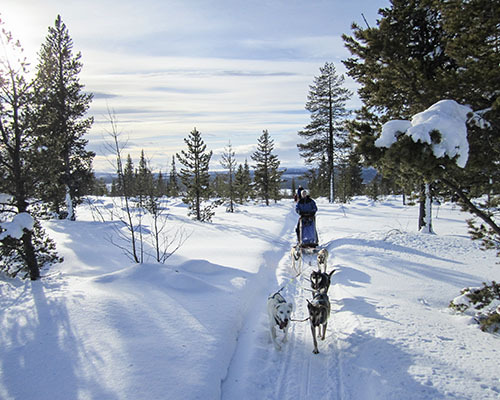 Ahead of you is kilometres of snow covered trails criss-crossing a landscape that defines Lapland. Starting in the lowlands you’ll have the destination of the mountains ahead of you as you make your way down frozen rivers. 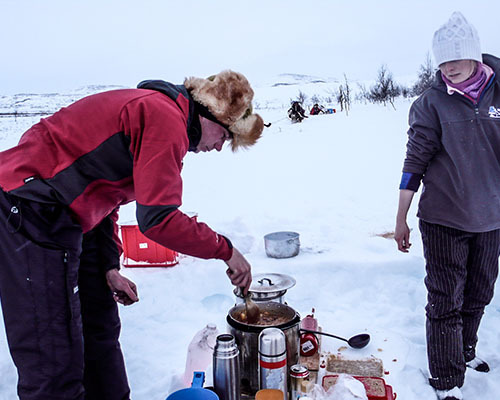 On the way, you’ll stop for an arctic picnic lunch. The length of the trail will depend on the conditions but typically you will cover between 45 and 60km each day. Tonight’s destination is a suitable camping spot where you’ll enjoy a night under the stars. Breaking camp and heading off down the trail you’ll start gaining some height and enter the ‘tundra’ area above the tree line. 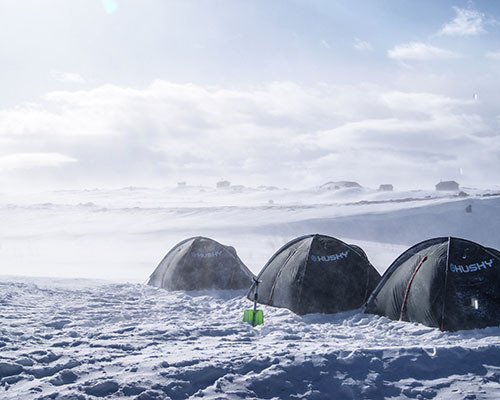 The scenery is spectacular and has been likened to Antarctica with its rolling white hills barren of tree life. 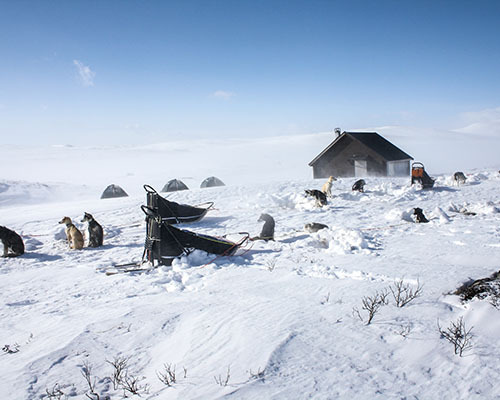 Lunch is taken on the trail and your destination is a remote cabin very close to the Norwegian border. The cabin is small but very welcome after a night camping. Clothes can be dried and bodies can be warmed before retiring to bed for a good nights sleep. At this time of year (the spring) the days are long and warm and it’s usually a very enjoyable time to be outdoors. However, storms are also fairly common in the mountains so we build in a ‘weather’ day to help absorb any challenges along the way. Under normal circumstances this means you have a free day in the mountains. 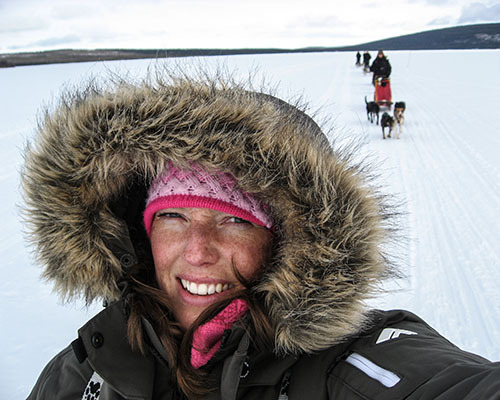 You can choose to go out on the trail with the dogs or try your hand at ice fishing in the frozen lake next to the cabin. You can also ‘walk’ to Norway as the Norwegian border is reached half way across the lake. There is a sauna in an adjacent cabin where you can freshen up before dinner. Today is your last day on the sled as you make your way down the mountain and back through villages to the large icy expanse of the Tornetrask. This is a large river section surrounded by picturesque mountains and is an uplifting end to the tour. 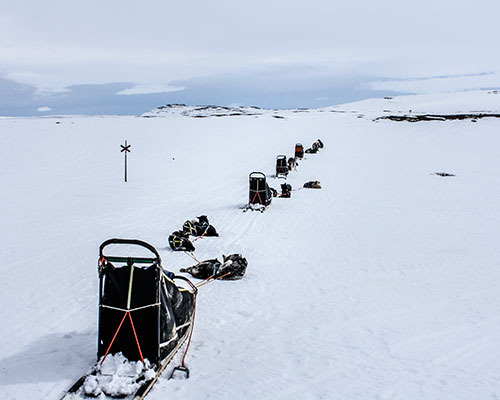 We meet a waiting vehicle on the shores of the Tornetrask and once all the dogs and sleds are loaded, you’ll return to the kennels. 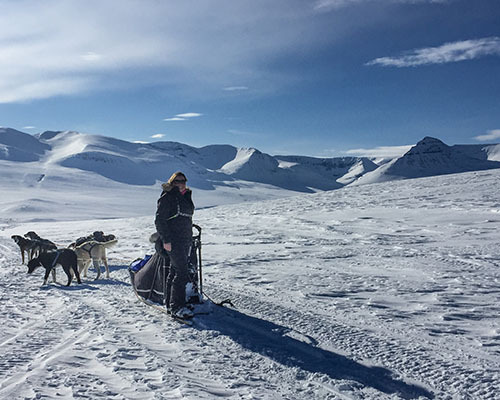 Once back at base, you can say farewell to the dogs before melting all your aches away in the sauna whilst sharing fond memories from the past week. Today may be your last day but the adventure has not come to an end yet! 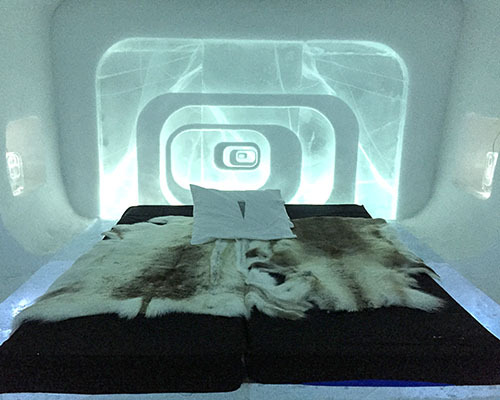 After breakfast you have the option to enjoy the unique experience of the famous ICEHOTEL in Jukkasjarvi. The hotel has a world-wide reputation for being the “coolest” hotel in the world – it is in fact a constant -5 degrees centigrade no matter what the temperature outside! This temperature makes it comfortable to stay in and walk around but cool enough for the hotel’s walls, beds, chairs and bar (complete with ice glasses) to stay frozen. The tour ticket allows you to view the 20 or so individually hand-crafted rooms with ice sculptures as well as the ice Church. Each year the hotel melts and is rebuilt so every room is different to the last and truly unique! 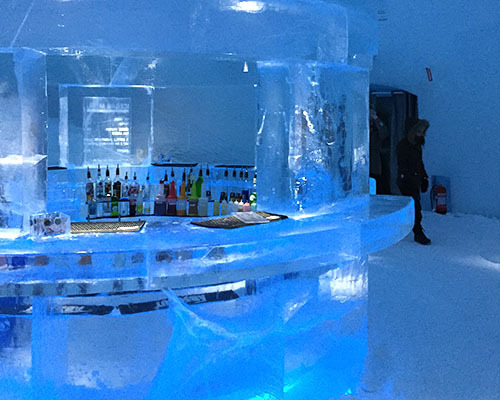 With themed rooms such as “Gotham City”, “Polar Bears” and “Aurora”, and the possibility of a drink at the ICEBAR or warm bar, it is an excellent way to spend the morning. We offer free transfers for this tour but the entrance fee is not included (approx. 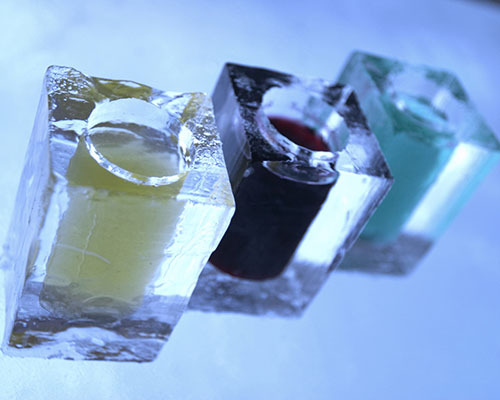 Adult SEK349) and is purchased at the ICEHOTEL on the day. Our services end with a transfer back to Kiruna or the airport.